In April 2016, Seibu Railway tourist train launched a 52-seater train restaurant called "Seibu Traveling Restaurant 52 Seats' Bliss". This train runs between Ikebukuro and Seibu Chichibu station, and the restaurant caters 4 course meals supervised by well-known Japanese, Western and Chinese chefs. Four coaches of the Train underwent considerable remodeling. The first coach is used for seating, the second and fourth coach has the open dining restaurant, and the third coach is used for as the kitchen area. The overall design of the train is highly influenced from the four seasons of Chichibu and Arakawa water (local Japan rivers). 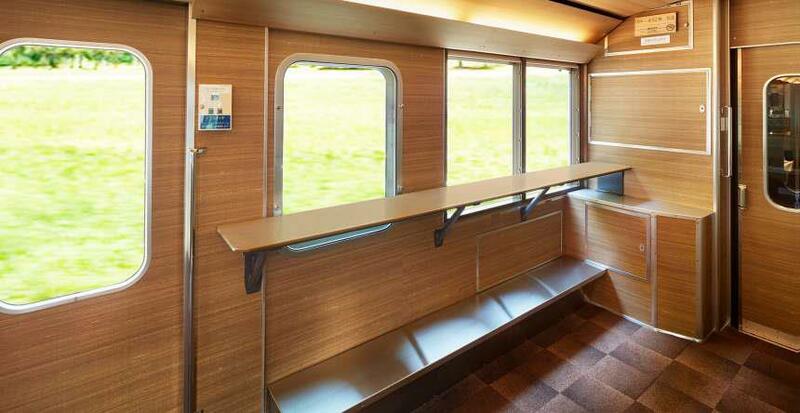 The interiors of the train employs nature as a motif with beautiful craftsmanship of traditional local timber. 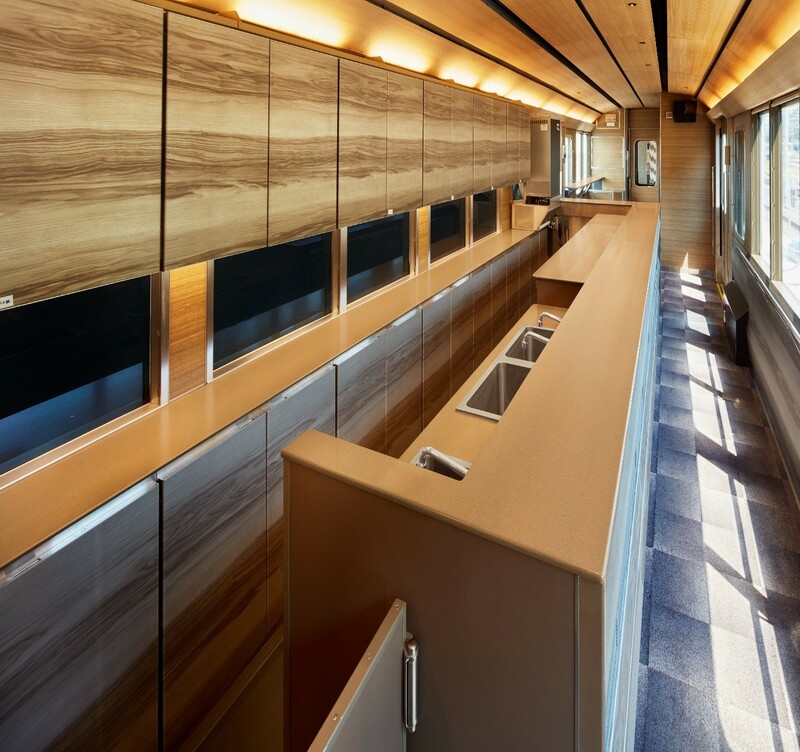 Corian® Solid Surface was used as an obvious choice for the open kitchen area setup in the 3rd coach. The design was performed by Kengo Kuma and Associates (KKAA). 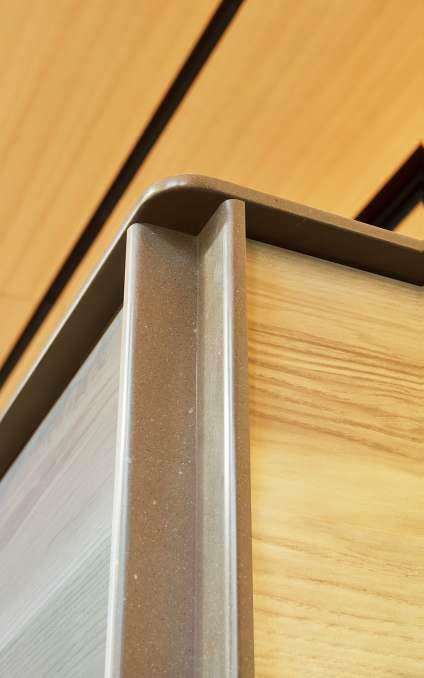 Corian® Solid Surface was used on countertops and parts that hold down the small edge of the aluminum panel at the counter waist. Passengers can freely access the cooking by MasterChef 's in the open Kitchen. "We wanted to arrange similar tones in the customer's eyes, so we adopted the same color of Corian® as the worktop & for the back of the counter”, says Mr. Meijo. "It was a major criterion that we have incombustible certificate for all the materials we were using in the railway cars. In addition to that, we also wanted to have a material that can sustain to the abuse of heavy daily traffic. Corian® Solid Surface became our ideal choice, thanks to its heat resistance and non-porous capability. Also, Corian® gave a warm look and feel to the overall environment” said Mr. Toshiki Meijo, Design Manager of KKAA. Corian® Solid Surface Montana suede was used for the bar counter in the same couch so that guests could enjoy drinks while watching the scenery outside the window. "Since we used various materials like cedar ceiling, carpet flooring, printed aluminum panels in the kitchen section, things like joints were inevitable. So, we thought that the kitchen counter, which is a big aspect in the space needs to be seamless. We wanted to have a long L-shaped counter. It is very good for us the counter made by Corian® can joint seamlessly. 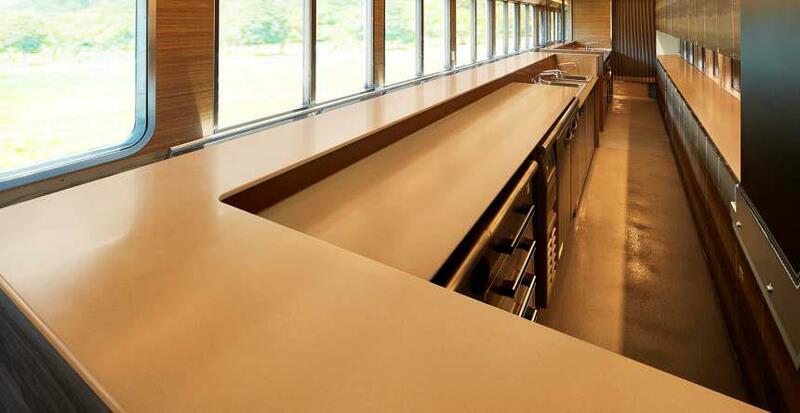 We concluded our research to Corian® Solid Surface color Montana suede. It is a color of brown tone that harmonizes with the whole vehicle” says Mr. Meijo.